GEN1REV22: Is it time to uproot the Darwinian tree of life ? 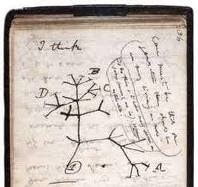 Is it time to uproot the Darwinian tree of life ? Because results of molecular comparisons are not in favor of, but opposed to, the theory of evolution , there are those asking is it time to uproot the Darwinian tree ? Elizabeth Pennisi, "Is It Time to Uproot the Tree of Life?" Science, vol. 284, no. 5418, 21 May 1999,... p. 1305. A year ago, biologists looking over newly sequenced genomes from more than a dozen microorganisms thought these data might support the accepted plot lines of life's early history. But what they saw confounded them. Comparisons of the genomes then available not only didn't clarify the picture of how life's major groupings evolved, they confused it. And now, with an additional eight microbial sequences in hand, the situation has gotten even more confusing.... Many evolutionary biologists had thought they could roughly see the beginnings of life's three kingdoms. When full DNA sequences opened the way to comparing other kinds of genes, researchers expected that they would simply add detail to this tree. But "nothing could be further from the truth," says Claire Fraser, head of The Institute for Genomic Research (TIGR) in Rockville, Maryland. Instead, the comparisons have yielded many versions of the tree of life that differ from the rRNA tree and conflict with each other as well. The REAL NOAH'S ARK : How big was the Ark ? Have you the brains to work this out ? EVIDENCE FOR YOUNGER SOLAR SYSTEM : Comets . FREE the SCIENCE FROM MOSES . WHAT DO THE LEADERS SAY ? PHYSICAL reality of Jesus Christ . The BEST INTERPRETATION of the EVIDENCE ??? ?